Have you ever wondered why New Forest ponies wander unhindered on the Crown Lands of the New Forest; or why neatly stacked and labelled loads of timber appear beside late-summer woodland rides? Well, the New Forest ponies, other grazing animals and timber are the property of New Forest Commoners, local people who enjoy traditional New Forest Common Rights. New Forest Common Rights recall a rural way of life that in most other places disappeared long ago. Yet in the New Forest, Common Rights continue to be used by those entitled to share the resources of the Forest in the old, traditional ways. Here, Common Rights are known to date back to at least early-medieval times, but probably go back much further, pre-dating William the Conqueror’s creation of this ancient hunting ground. Elsewhere, use of Common Rights was also once widespread in much of rural Britain, often the preserve of hard-working men with little land to call their own, men who depended on shared access to common land that all too often was of too poor a quality to be used by the Lord of the Manor. But from at least the 15th century, Common Rights elsewhere were progressively lost as land was enclosed by the wealthy, or fenced on a smaller scale by legal or illegal means. In the New Forest, however, circumstances conspired to ensure that the majority of Common Rights remained. Status as a Royal Forest severely restricted development. Unique, somewhat tangled management structures made decision making difficult. Relatively poor soils were often of little value, even if enclosed for private use. And generations of New Forest Commoners showed a solid determination to retain the Rights that had been enjoyed from time immemorial. But what New Forest Common Rights exist today, what do they mean and in what way do they provide benefit? Well, the Common Rights currently in use are Common of Pasture, Common of Mast and Common of Fuelwood. Common of Pasture is the most frequently used. 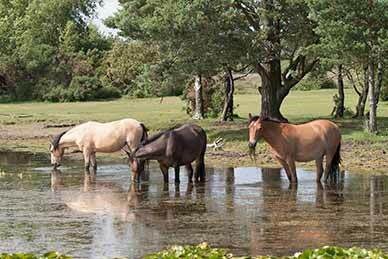 On payment of a ‘marking fee’ for each animal; ponies, cattle, donkeys and mules can be put out to graze on the open lands of the New Forest. Common of Mast is used during the autumn Pannage Season, and allows pigs to be put out to fatten on the harvest of fallen acorns. It is a practice that is good for the pigs and good for the ponies and cattle, for acorns are poisonous to ponies and cattle, and lead to numerous fatalities each year, but do not harm the pigs. And Common of Fuelwood, sometimes known as Estovers, allows Commoners to cut and collect a stipulated amount of firewood from the New Forest, but only for their own personal use in the house to which the right relates. In practice, however, the Forestry Commission cuts the wood and stacks it by convenient ride-sides for collection by those who enjoy the entitlement. Common Rights are not associated with people other than through ownership or occupation of land or property, so if Commoners sell-up or relinquish occupation, their Common Rights are lost, and those, if any, associated with their new land or property apply. (In fact, Common of Pasture and Common of Mast are associated with land, whilst Common of Fuelwood is associated with hearths). If there is a road traffic accident involving a pony, cow, donkey, pig, sheep, dog or deer you should phone the police on 999 (emergency) or 0845 045 4545 (non-emergency). If you need to report a sick, injured or distressed pony, cow, donkey, pig or sheep, then you should call the Verderers' Office on 023 8028 2052 during office hours (Mon-Fri 9am-5pm). Outside of these hours, call the Forestry Commission on 0300 067 4600 (24 hrs). If you need to report dangerous dogs - chasing or attacking people, wildlife or livestock, for example - you should call the police on 999 (emergency) or 101 (non-emergency). 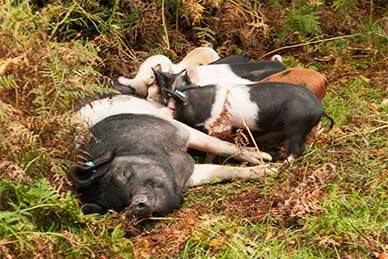 Contact the dog warden at New Forest District Council to report lost, stray or out of control dogs. The numbers to ring for the warden are 023 8028 5411 (office hours) and 023 8028 5202 (out of office hours). Additional information can be found on the National Park website. (Free wallet-sized cards with these details can be picked up from the Lyndhurst Community Centre reception and other locations around the area, along with free 'I go slow for ponies' car stickers).